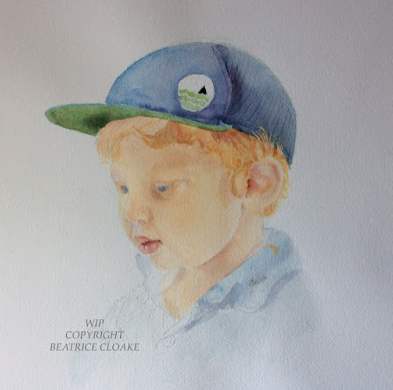 I am using photos to explain how I produce a portrait in watercolour. Actually, some people told me, it was easier to follow than a video. 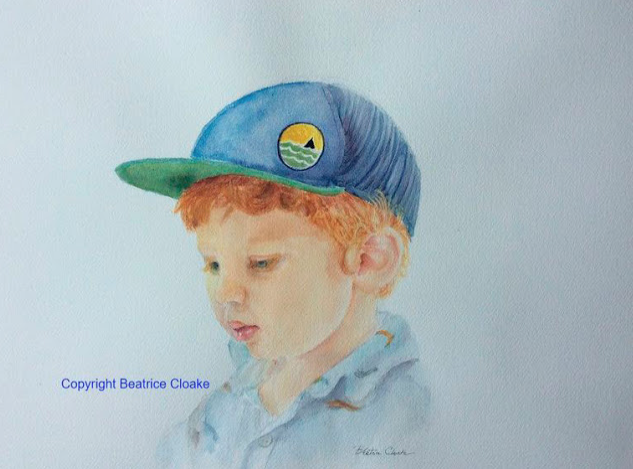 My first photo is showing the drawing and the first touch of Watercolour. The grandmother of this little boy is a professional photographer. She provided several shots. I decided on which one I would be happy to work with. This photo is not brilliant! It will do. I transferred the drawing, using the grid method. It is exact within the dimensions. I have added some masking fluid on some part of the hair. I am working on Arches paper 140lb. 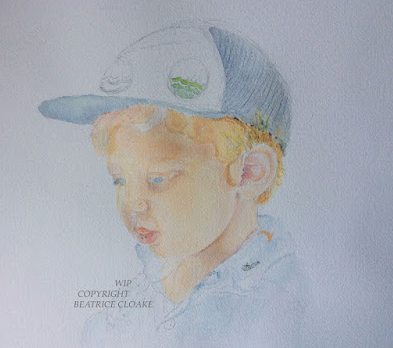 I am using Winsor Newton Fine Art Artist watercolour paint. My first layer is a mixture of Raw Sienna + Permanent Rose. 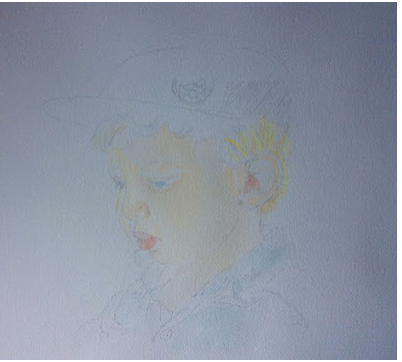 I am now working on the ear and try to add the edge of the cap between the hair. I have added shadow on the neck. At this stage, I am trying to establish light, shadows, colour. Still searching to establish and position the shadows. I have started on the cap in view to find the balance between the colours of the entire painting. The cap so far: Cerulean Blue + Cobalt Blue. Working on the cap: Same blues + Permanent Rose for the shadow. The front of the cap: Aureolin + Cobalt. The hair: Aureolin + Permanent rose. 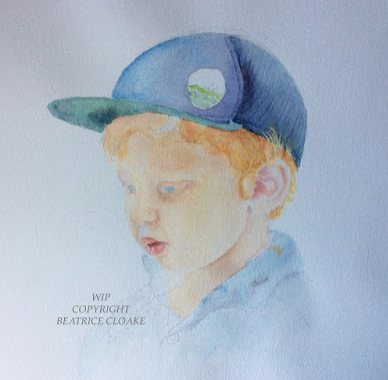 Later I will add shadows by adding a touch of ultramarine to Permanent Rose + Raw Sienna. Now several layers of the skin colour has been added. I add gentle tones with shadow colours mentioned earlier. This is the finished painting.